The Wacky Rig is very simple and easy to know how to set up, and one of the best productive methods to use for freshwater fishing. It's often an underutilized rigging technique by many anglers, but it's one of the most effective presentations for attracting and catching fish. 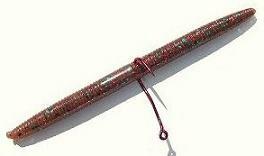 The bottom line is that wacky style fishing rigs are a very powerful and a crafty way to catch a lot of fish! This wacked out fishing rig will have the fish going crazy! Ideally, I like to use, and therefore recommend a 7' spinning rod and reel, 8-10 pound test fluorocarbon line, and short shank round style wide gap hooks. Wacky rigging hooks can be found in a variety of options of shapes, with weed guards included, and of course, sizes and colors. 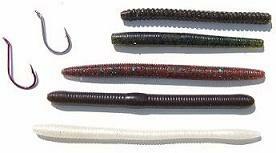 In the picture below are just a few different examples of styles of hooks, and finesse baits of worms and senkos. It depends on conditions and your desired presentation for which you would choose to use yourself. Generally, 4"-7" finesse baits are the most efficient. 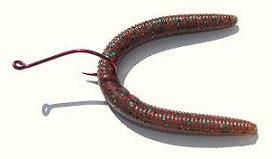 Wacky rigging tackle - finesse baits, plastic worms, senkos, and octopus hooks. There are a couple simple methods for rigging this fishing rig. In this first demonstration below, we're using a green pumpkin colored, Berkley PowerBait Heavy Weight 5" weighted Fat Sinkworm. 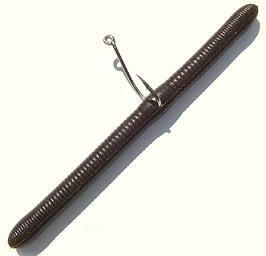 Just simply push the hook point in through the fat egg sack of the bait, which can also be the thickest portion of the bait. And that's all there is to it. The most common way is going through the middle of the bait. The fat egg sacks are not always included or positioned in the middle of the baits. And to achieve some of the best action to appeal to the fish, penetrating the hook in through the middle of the bait is also often better. Simply fold the bait in half to where the two ends meet and touch each other. This will help allow you to determine the exact center of the bait. Then just stick the point of the hook in through the center of the body of the bait. And there you go. The wacky attack rig! Now you're ready to go wack out and catch some fish. Good luck freshwater fishing! Get wacky with it using this deadly fishing rig!